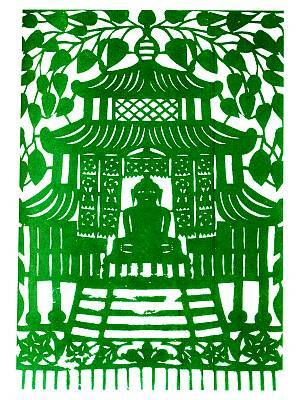 Present throughout China and in various ethnic groups, paper-cut is a popular art integral to everyday lives. A predominantly female pursuit, it is transmitted from mother to daughter over a long period of time, beginning in childhood, and is particularly common in rural areas. It earns the most skilful artists respect and admiration. 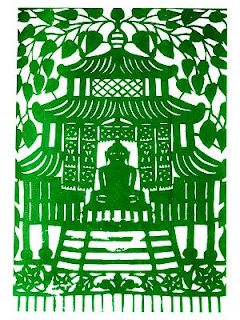 Many techniques are used: the paper can be cut or engraved with a chisel, coloured or left blank. Increasingly, modern technologies are used. Motifs, which vary greatly and are often devised by the artist, depend on the region of origin (for example, in southern China fine and delicate motifs predominate) and the purpose of the product, which might be used for interior decor (windows, beds and ceilings), festivities (weddings, birthdays and ceremonies), or prayers (invoking the rain, warding off the devil, and so on). As a key part of Chinese social life in all ethnic groups, paper-cut expresses the moral principles, philosophies and aesthetic ideals of its exponents. It continues to provide an outlet for emotion and is experiencing an unprecedented revival.